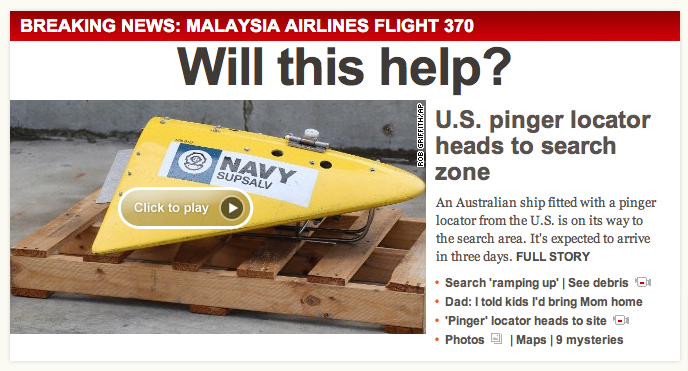 As March comes to a close, CNN has been getting some flak for their wall-to-wall coverage of Malaysia Airlines Flight 370. But while that mystery has dominated their television programming, other big stories are also getting play online. Along with the ironically ubiquitous missing plane, the tense situation in Ukraine, the Oscar Pistorius trial, and the recent landslide in Washington state have all kept CNN readers glued to computers and mobile devices. A recent memo from CNN President Jeff Zucker highlights the network’s successes for March as the best month ever for page views and video streams across domestic and international desktop sites and mobile web traffic. As March comes to an end, I wanted to take a moment to say thank you to the entire worldwide CNN team for an extraordinary month. Your work, from Malaysia, Australia and Beijing, to Ukraine, Crimea and Moscow, to Pretoria and Washington state (and yes, Mississauga, Ontario, too), has once again shown the global power of CNN. Audiences have come in record numbers to every one of our platforms: CNN in the United States, and around the world on CNN Digital, CNN International and CNN en Español. On our digital platforms, March was our best month ever for both page views and video streams across our domestic and international desktop sites. And our best month ever for mobile web traffic. We will likely have more unique users across our global sites than any month in our history. On television, the same is true. CNN International has been watched around the world for our coverage of the crisis in Ukraine, the mystery of the missing Malaysian airliner and the Oscar Pistorius trial in South Africa. CNN International – always the go to network. In Latin America, CNN en Español has led the way in coverage of the ongoing events in Venezuela. And in the United States, CNN has been incredibly strong journalistically, especially on the missing plane, Ukraine and the devastation in Washington state. Through it all, your tireless work, in front of the camera, behind the camera, in edit rooms and control rooms, in newsrooms and makeshift newsrooms, satellite desks and everywhere CNN operates, has been superb. When news breaks, the world once again has chosen CNN. Digitally, domestically, internationally, in English and in Spanish.